Sergeant John Parkhurst, is a Lincolnshire Lad in the Royal Air Force and has completed tours at RAF Linton-on-Ouse, RAF Benson, Falkland Islands and RAF Halton. After becoming a Parachute Jump Instructor in November 06 he served on Military Training Flight and Brigade Parachute Flight at RAF Brize Norton before being selected for duties in October 2010, as a member of the RAF Falcons, which are a unique Team and widely recognised as the UK’s premier military Parachute Display Team. So Lincolnshire’s Premier Online Magazine decided to interview Sgt John Parkhurst of the UK’s premier military Parachute Display Team, who is flying the flag for Lincolnshire. What are your fondest memories as a child in Lincolnshire? I was born in Gainsborough in 1977 and raised in a place called Retford which is on the Lincolnshire/Nottinghamshire border. My fondest memories are playing football around the area. I used to play for Retford Rail in the Lincs Premier League in the late 90’s and enjoyed travelling around the area playing various teams. What do you like most about Lincolnshire? I love the Lincolnshire area and am very proud to say I am from that part of the Country. When you were a child. What did you want to grow up to be? As a child I wanted to be a footballer. I played all sports at school but football definitely played a big part in my life, playing for different clubs on Saturdays and Sundays from the age of 12 onwards. Any particular reason for joining the RAF and the branch of the service that you did? I joined the RAF by chance really. I met a friend playing football one Sunday and at the time he was going through his Physical Training Instructor (PTI) training at RAF Cosford. He said I would love it so the next day I went to the careers office and 6 months later I was in. Did you ever think you would end up being with the RAF Falcons? As soon as I joined up and watched a video of the RAF Falcons I knew that what I wanted to do. However it takes quite a while to progress through the various jobs to reach that level. It took me 7 years as a PTI before starting training as a Parachute Jump Instructor (PJI). Another 4 years as a PJI training the Airborne Forces before going on Selection to be an RAF Falcon. I’m now in my first year of a three year tour with the Team and love it. Have any of your family been in the military, especially the Royal Air Force? None of my family have been in the military. Do you still have family and friends in Lincolnshire ? My parents still live in Retford but all my friends that I keep in touch with have moved on. What do you enjoy most about being with the RAF Falcons? The RAF Falcons is a very close working environment. During the season (May – Sep) we are living with each other most of the time as we travel round the Country performing for the public. During the off season we spend 3 months in Southern California training for both the Display Season and gaining qualifications appointments after the Falcons. Once we have finished our 3 year tour on the Display Team we will go on to work with the Special Forces and therefore need a great deal of intensive training to perform to the desired level. To answer the question I love being with a great bunch of lads who are very professional in their job. Meeting the general public after performing a display is also a very nice aspect of the job. 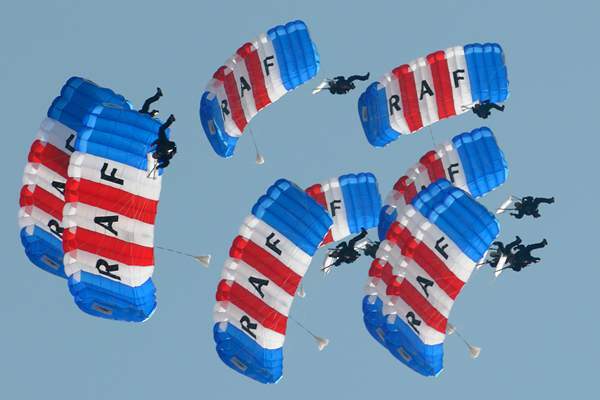 Is there a favourite display or manoeuvre that you like the most with the RAF Falcons? I love doing the beach displays. We don’t do many in a season so when they come around it’s a bit special. Have there been any humorous incidences with the RAF Falcons? There have been lots of humorous incidents with the team but they will definitely stay within the confines of the team. Sergeant John Parkhurst, you are definitely a great credit to the Royal Air Force and to the county of Lincolnshire and we look forward to you and your Teammates many fine displays to come. LincsMag salutes you.